1) Open the cup by pulling the lid halfway and add seasonings from sachet. 2) Pour 280 ml of boiling water (to the place indicated on the package). 3) Cover and brew for 3 minutes. 4) Carefully stir the soup and Enjoy! Ingredients: Noodles (79%): Wheat Flour, Palm Oil, Modified Starch, Salt, Raising Agents (Sodium Carbonates, Potassium Carbonates). Liquid Sauce (19%): Soya Sauce(Water, Soya Beans, Wheat, Salt), Sunflower Oil, Sugar, Flavour Enhancers (E621, E635),Flavours (Milk), Spices (Ginger, Horseradish, Black Pepper, All Spice), Yeast Extract, Acidity Regulator (Lactic Acid). Vegetable Seasoning: (Onion, Carrot, Celery, Sunflower Oil, Onion, Sugar, Corn Starch, Salt, Garlic, Black Pepper). Garnish (2%): Chives, Beef Meat Pieces (0.7%). 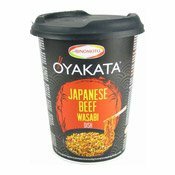 Simply enter your details below and we will send you an e-mail when “Oyakata Instant Cup Noodles (Japanese Beef Wasabi) (親方芥抹牛肉炒麵)” is back in stock!